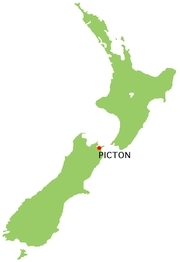 Picton is a town in the Marlborough region of New Zealand. It is near the head of Queen Charlotte Sound near the north-east corner of the South Island. The population was 2925 in the 2006 Census, a decrease of 75 from 2001. The town is named after Sir Thomas Picton, the military associate of the Duke of Wellington, who was killed at the Battle of Waterloo. Inter-island ferries to and from Wellington arrive and depart here by way of the Marlborough Sounds. Most of the sheltered part of the route is through Tory Channel, south of Arapawa Island. The township of Waikawa is a couple of minutes' drive from Picton, practically part of the same town. 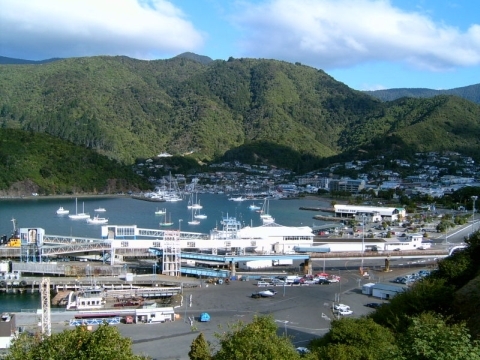 Waikawa hosts a marina, one of the largest in New Zealand. The Main North railway line and State Highway 1 link Picton southwards to Blenheim, Christchurch and beyond, while scenic Queen Charlotte Drive (shorter in distance but usually slower than State Highway 1/State Highway 6 via Blenheim) winds westward to Havelock. The daily TranzCoastal long-distance passenger train to Christchurch begins and terminates in Picton. 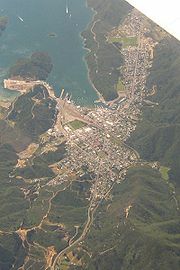 Nearby settlements are at Anakiwa, Waikawa, and Shakespeare Bay. The first school opened in Picton in 1861 at the corner of Devon Street and Broadway. A new school opened in 1882, and part of the old school was moved to the new site, but was destroyed by fire in 1928. A Catholic Convent school opened in 1915, and was replaced by St Joseph's in 1924. Queen Charlotte College is a secondary (years 7-15) school with a decile rating of 4 and a roll of 349. Picton School is a contributing primary (years 1-6) school with a decile rating of 3 and a roll of 134. St Joseph's School is a state integrated contributing primary (years 1-6) school with a decile rating of 5 and a roll of 30. Other primary schools in the area are at Linkwater, Koromiko and Waikawa, Marlborough. The famous author Katherine Mansfield spent some time in Picton where her grandparents, Arthur and Mary Beauchamp, and her father Harold, lived for some time when they came from Australia. 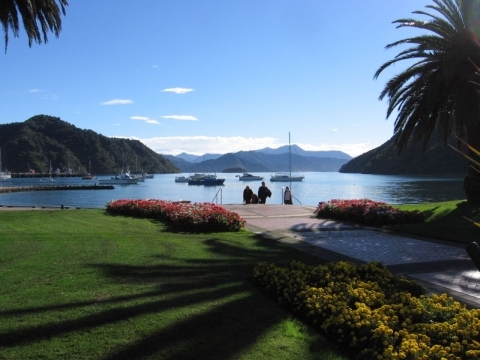 She included a reference to the port in her short story "The Voyage" (in the collection The Garden Party), which is "an account of a trip to Picton from Wellington on the Cook Strait ferry".